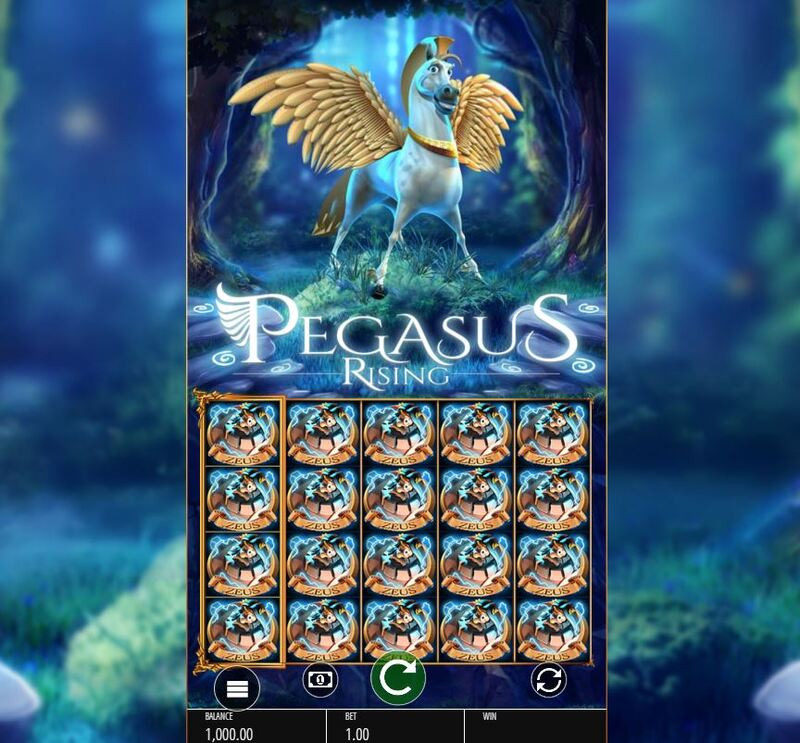 Pegasus Rising slot brings us a piece of Greek Mythology from Blueprint gaming as the winged horse, sired by Poseidon with Medusa as the mother. This parental combination spells both power and danger and we get both here with Blueprint using the Extending Reels format which first appeared with their trademark Thundercats slot. 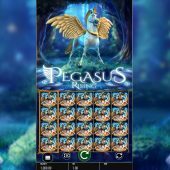 The dramatic symbols and soothing classical music as we spin are somewhat negated by the idiotic grin the animators decided to give the Pegasus character, but maybe this implies he may be equally as soft on our bankroll? The slot is far less complex than many Blueprint titles with their convoluted in-play and free games features, namely Ted and King Kong Cash and we only get two features here. The reels are a 5x4 grid with 30 paying lines, although as you can tell by looking at the elongated design, these can extend in the bonus feature. All symbols are stacked and pays are low, just 4x bet for 5-of-a-kind Zeus, 3x for Poseidon, and 2x for both Kraken and Medusa. I'm not sure how the Kraken arrived in the Mediterranean given that he supposedly only exists off of the coasts of Norway and Greenland, but maybe he has taken a liking to warmer waters? Anyway, there are 5 card values to finish off the pays, at 1.5 or 1x your 50-coin bet. This is what the first feature is bizarrely called, because it doesn't use the Colossal Reels at all - if you land 4 identical symbols on reel 1, they lock in place and all the remaining grid positions spin as individual reels, and continue to do so until any spin doesn't add any further matching icons or you have filled the grid. The potential isn't colossal though as even a full grid of Zeus will only pay 120x bet. You may have seen this type of spin in the base games of slots like Jack Hammer and Barber Shop Uncut. I haven't mentioned the Wild yet but naturally it's the Pegasus and appears only on the centre 3 reels. Land all 3 and you get 3 re-spins with the Wilds locked in place. Each further Pegasus Wild will stick in place too and add 1 spin, but will also extend the reel set to 5 rows and 50 lines, then 6 rows with 60 up to a maximum of 8 rows with 80 lines. This raises the best potential win to 320x bet as the stacks also grow to 8 rows high to match the extended reels.